TLP is an excellent method for characterizing a device's response to a fast ESD pulse. One can produce a current-voltage characteristic for an input or output pin. This can be useful for determining snapback characteristics, and the behavior of a structure in the low-resistance on condition. This diagram shows the basic elements of a transmission line pulse system. TLP testers use a 50-Ω coaxial cable to form and transmit the pulse. The length of the cable determines the test pulse's length. Each meter of cable adds approximately 9 ns to the pulse, so to get a 100-ns pulse you need about 10 meters of cable. A low-resistance relay connects the cable to the DUT either through a resistor, as shown here, (which is referred to as the constant-current method) or an attenuator and low-pass filter (which is referred to as the constant-impedance method). To measure the voltage across and the current through the DUT during a TLP pulse, a TLP tester uses an oscilloscope with at least a 500-MHz bandwidth. A voltage probe connects between the device's test pin and ground. A current probe measures the current that enters the DUT. While many TLP testers use constant-current and constant-impedance methods to calculate current, others use a different technique: time-domain reflectometry. These testers use a delay line and an attenuator following the relay. 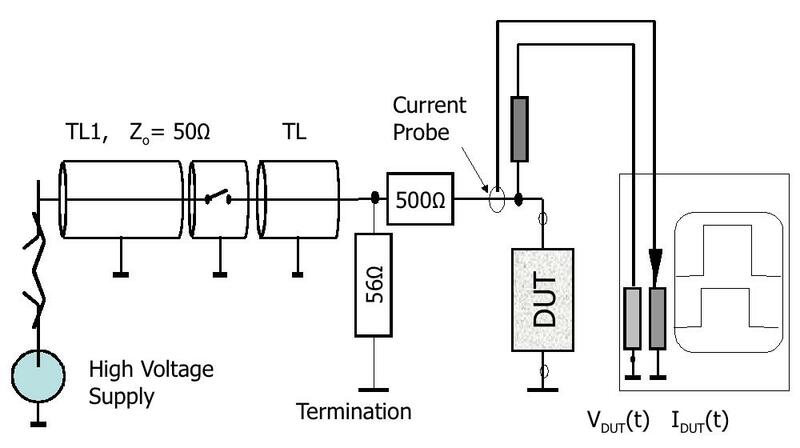 The tester measures the amplitude of the current pulse entering the delay line, and then it measures the amplitude of the reflection from the DUT. From the difference in amplitude, the tester can calculate the current and voltage in the DUT. The delay line ensures that the reflected signal won't interfere with measurements on the incident signal. Regardless of which method you use to calculate current, the TLP tester injects current into a MOS device's drain with the gate and source grounded. As the tester increases the pulse amplitude, failures will begin to occur when the end of the pulse reaches the DUT. By that time, the device will have had to withstand all of the pulse's total energy. International Reliability Physics Symposium (IRPS) on April 27-May 1, 2008 in Phoenix, AZ, USA – IRPS is the leading conference discussing the newest failure mechanisms and the latest developments in reliability characterization. John Suehle, our Advanced Reliability Challenges course instructor, is the General Chair of the conference. Chris Henderson will be chairing the Failure Analysis session. Advanced Materials and Failure Analysis (AMFA) Workshop on May 2, 2008 in Phoenix, AZ, USA – AMFA is a new workshop dedicated to advanced electronics materials and failure characterization. AMFA is structured as a "Gordon" conference, allowing ample time for discussion and follow-up with the presenters. Chris Henderson is chairing a portion of the conference on nano-analysis techniques.